[Animals] Lions, Tigers, Leopards, etc. [Animals] Mice, Hamsters, Guinea Pigs, Squirrels, etc. [Fiction][Animals] Lions, Tigers, Leopards, etc. [Fiction][Animals] Mice, Hamsters, Guinea Pigs, etc. [History] Symbols, Monuments, National Parks, etc. 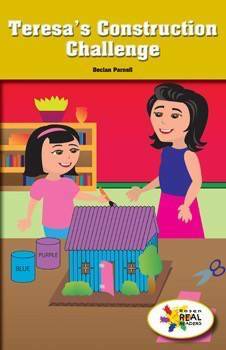 In this descriptive text, Teresa shows how to plan and build an arts and crafts project. Key details and colorful illustrations will help emerging readers count along with the character as she builds a house. This fiction title is paired with the nonfiction title Building a House with Lego. Dimensions: 5 1/2" x 8 1/2"
Rosen Publishing, Inc. is an independent educational publishing house that was established in 1950 to serve the needs of students in grades Pre-K-12 with high interest, curriculum-correlated materials. © 2019 Rosen Publishing Group, Inc. All Right Reserved.